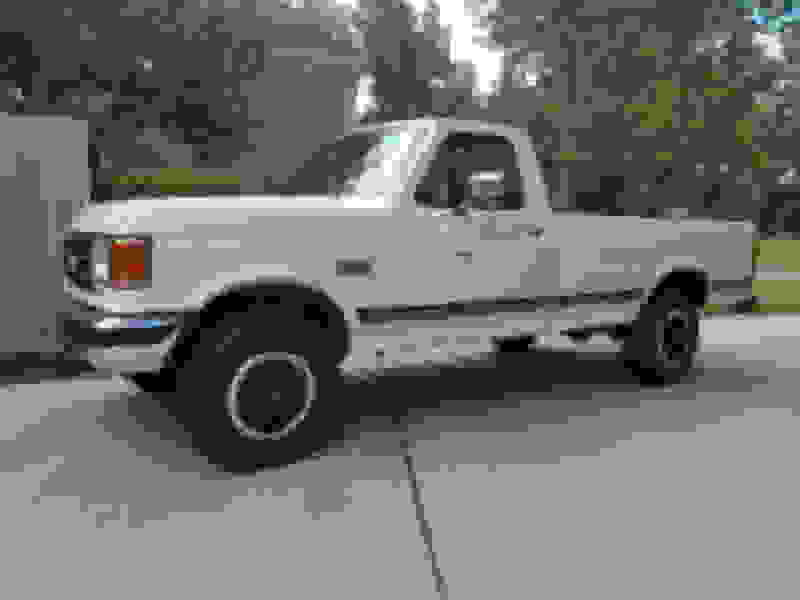 Hi I have a 1992 F150 regular cab long box 4X4 and I would like to raise the front end up a bit because I'm not a big fan of the rake. What I would like to do is take a pair of coil springs from a similar year f250 and swap them onto my f150. Is this possible to do without too much hassle? Would you recommend springs from a 2wd f250 or 4x4? Also if I change the front coil springs, will I need longer shocks? Keeping in mind that my truck has the quad shock option (1 on each side of the coil) I would probably have to lose one of them, correct? Any answers to my questions would be excellent! F250 4x4 is leaf spring in these trucks. Yup, no 250 coils. Leafs that sag as bad as coils! You may find that a new set of fronts is all you need- they all seem to sag in front over time. There are f250 (2wd, I know 4x4 was leaf sprung) coils available from moog. They aren't actually any different than bronco or f150 coils, and some econoline. Cc822, cc824, or cc844 will all get your nose back in the air. You can certainly try swapping them, though they may be saggy too. Shouldn't need to delete a shock, all coils are the same diameter for these fords. Thanks for all the replies everyone! If I decide to do the coil spring swap, would that make the truck close to level? Rear spring sag/wear will likely dictate how level it sits. Might take an iteration or two to get it where you want. I put Moog CC844 coils in my 96' supercab 5.8L 4x4 and the front end went up 1.25". Be aware you'll need an alignment and if you go too high it will be beyond what can be adjusted for. Either DIY or find a good shop familiar with ttb. As cheap as the new moog springs are, I wouldn't waste my time with used factory springs. It is considered rude to cut to the front of the line when one joins the crowd jumping off the bridge. Do it anyway.